Meanwhile, in more modern times, the iPhone in my pocket has a six-axis gyroscope that is smaller than a grain of rice. What is the screen grid tube? What does it do? What are the advantages of the condenser speaker? These are a few of the questions that occur to folk trying to keep abreast of developments. Mr. Miller, who attended the Chicago radio shows, here gives the answers. I WENT to a furniture show the other day and saw some clever new adaptations of radio to home decorating. And then I went to a radio show and saw the finest furniture exhibit in Chicago. That, in brief, is the status of the radio business in this winter season of 1929-1930. Radio has gone Grand Rapids with a vengeance. There’s no comfort in that for the dyed-in-the-wool fan who helped raise this radio business from its crystal detector days, but the lady who wants a decorative piece of furniture for the home, and the man who wants the chain programs, with the best possible reproduction, and beyond that doesn’t care how the thing works, are at last getting their innings. In the technical field the most interesting developments of the year have been the screen grid tube and the condenser speaker, the latter having its first public showing at the shows. 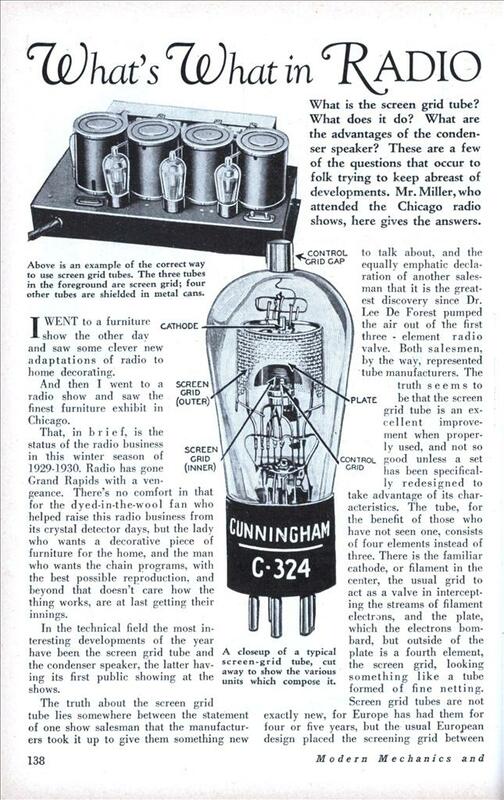 The truth about the screen grid tube lies somewhere between the statement of one show salesman that the manufacturers took it up to give them something new to talk about, and the equally emphatic declaration of another salesman that it is the greatest discovery since Dr. Lee De Forest pumped the air out of the first three – element radio valve. Both salesmen, by the way, represented tube manufacturers. The truth seems to be that the screen grid tube is an excellent improvement when properly used, and not so good unless a set has been specifically redesigned to take advantage of its characteristics. The tube, for the benefit of those who have not seen one, consists of four elements instead of three. There is the familiar cathode, or filament in the center, the usual grid to act as a valve in intercepting the streams of filament electrons, and the plate, which the electrons bombard, but outside of the plate is a fourth element, the screen grid, looking something like a tube formed of fine netting. Screen grid tubes are not exactly new, for Europe has had them for four or five years, but the usual European design placed the screening grid between the old grid and the plate, instead of outside the latter. In theory the screen grid tube, as used in the radio frequency stages, develops a possible amplification of forty times the input, as compared to an average amplification of eight in the old 201-A of more or less blessed memory. That means that with 201-A’s the first tube in the r. f. stage amplified the signal eight times, or 64 times the original input, and so on. In actual practice a couple of manufacturers, through careful design, are getting amplification of thirty-five times out of the new screen grids, which is close enough to the theoretical perfect to make the tube well worth while. Careful design, in those cases, includes shielding the lube, shielding the coils separately, and also shielding the condensers. The condenser speaker invented by Colin B. Kyle, a California school teacher, was the one new thing in reproducers this year, and, though fifteen manufacturers of sets have been licensed to use it next year, it so far appears only in sets made by a sub- sidiary of the company that financed Kyle’s invention. The condenser speaker, however, got a good boost at the Chicago show when all of the exhibition rooms were completely equipped with a broadcast system employing them, with excellent results. The chief advantage of the speaker is that it lends itself to such varied use, though this is backed by excellent reproduction, as good as any dynamic, magnetic or cone type in general use, and better than many of them. The speaker is made in standard sections, about 8 by 12 inches in size, and any number of these sections can be combined to build a speaker of any size or shape. The sections are hardly an inch thick, and a half dozen of them assembled behind a framed tapestry can hang on the wall like a picture. Unlike all previous speakers it has no moving parts, in the accepted sense, and no magnets or coils. A plate of aluminum is punched full of little slots, about 1/2 by 1 inch, coated with a thin non-conductor, and over that is glued a sheet of foil. The metal plate is given a negative bias of some 400 volts, and one side of the radio output is attached to the plate and the other to the foil. One interesting thing about the show was the number of makers who are getting away from revolving dials and producing a straight line tuning device, with a knob moving from side to side. An interesting improvement, shown on two makers’ sets, was a semi-automatic tuner, in which the favorite stations are marked on a horizontal strip of cardboard, the knob is shifted until a pointer points to the one desired, and the knob is then pulled outward, when the connecting mechanism revolves the condensers to the exact point needed to tune in that station. Another interesting tuning device has come out of Thomas A. Edison’s laboratory, a red light behind a transparent revolving strip, which lights only when the station is exactly tuned. A station is tuned to maximum volume, and its call letters then written on the transparent strip. Next a screw driver or the edge of a dime is inserted in a screw head beside tin tuning dial, the screw given a half turn, and a cam arrangement operates a punch which marks an impression in a thin copper disc, revolving beside a contact point. Next time you want that station the warning light will come on when the impression of the disc touches the contact point. Comparing this year’s New York and Chicago exhibitions with the shows of three years ago some of the notable changes were: Bakelite panels have absolutely disappeared, in favor of wood in practically all of the console models and wood or metal in the other sets. There was not a single kit or parts maker displaying at the Chicago show, with the exception of one manufacturer of short wave transmitters and receivers. Not a sin- gle storage battery was on exhibition —everybody having gone “all-electric.” The only dry cell exhibit was confined to small flashlight and electric lantern batteries. A number of cabinet makers exhibited, but confined their attention to the trade, and none offered cabinets for heme built sets. The all-electric extent of the shows this year is surprising, for apparently nothing is being offered for the family that hasn’t had its house wired, or lives beyond the reach of the electric lighting lines. Of course, there are still large stocks of battery sets on the markets, unloaded at sacrifice prices, but none of them get into the shows. A typical newspaper advertisement during the Chicago show offered $285 seven-tube console models at $49.50. I often recharge my iPhone on top of my 1930s era Stewart-Warner console radio. I like the juxtaposition. 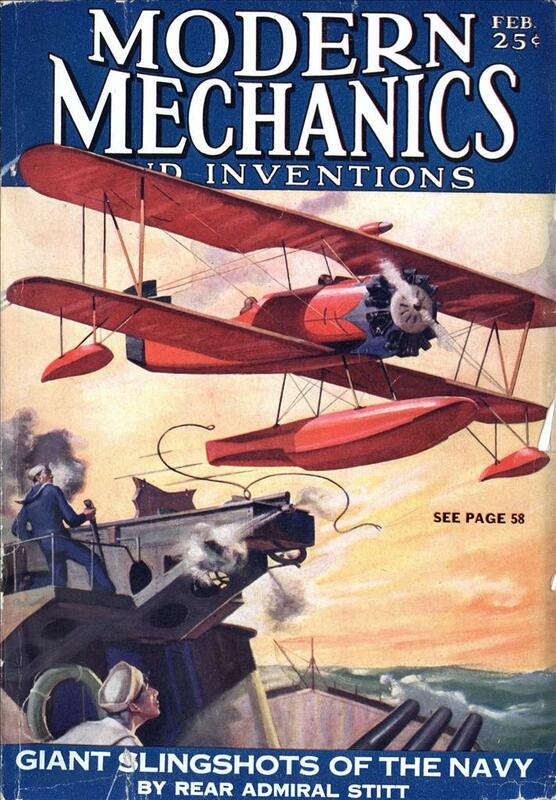 I love the old technology, when the average person could still understand how things worked, and even build their own. I have a C484 triode sitting next to my computer. It’s a pretty thing, partially silvered with all the elements clearly visible. My best old on new juxtaposition was listening to “X Minus One,” an old time science fiction radio show, on XM Radio. Space tales from space.